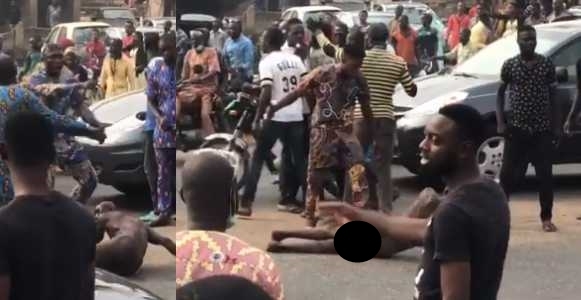 An angry mob has descended heavily on a suspected kidnapper after stripping and parading him in public. A suspected kidnapper has been assaulted by an angry mob. The victim was stripped n-ked, paraded, beaten and had a tyre thrown around his neck. "I just witnessed this. The mob refused to let anyone intervene. This person was allegedly caught trying to kidnap a child. This is currently happening at Monatan Ibadan. Any society where the law constantly fails the people, the people will take the law into their hands. Jungle Justice is evil, it is not justice in any sense. Justice justice though is entrenched because the people have lost faith in the criminal justice system. “If you hand him over to the police, his Godfathers will get him out” was the constant refrain today. Savage reality. This is barbaric." He added in another post.